Sorry for the delay in posting. Work got hideous there for a bit. But I'm taking a few days off now, so I will add to the posts. 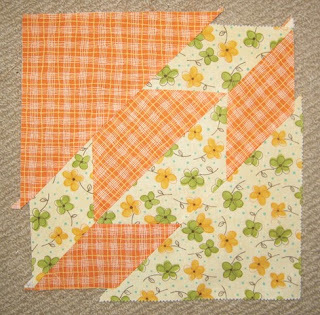 Here, finally, are the instructions for what a finished square should look like. You've all got enough fabric to be producing 8 of these (7 for Jen). 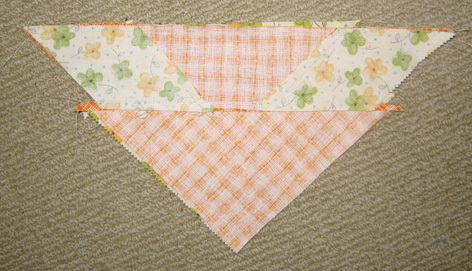 Place them, right sides together and sew quarter of an inch along the long edge of the triangle. As, with other parts of this pattern, there might be a few wobbly bits. That's OK. As you can see in the pic below, the edges line up for most of the length, but there's one bit hanging out. When sewing keep to the straight, and ignore the hanging over (or under) area. 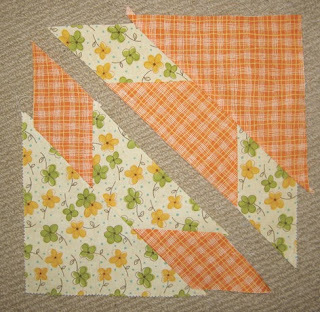 Once, you've sewn the pieces, you then need to iron them flat. Iron on the wrong side first. 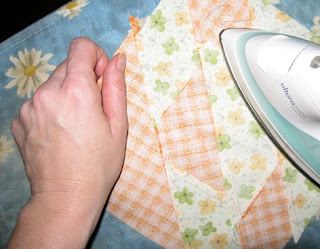 Iron the seam in one direction and pull the fabric away from the iron as you go. 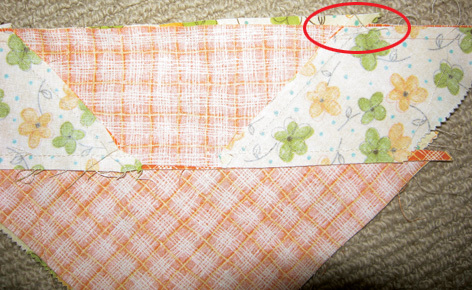 Then turn the square over and iron the again pulling the fabric away from the iron (pic below). You really need to do this with all the seam ironing as you go. Sometimes you can sew a small fold into the piece if the seams haven't been stretched out when ironed. 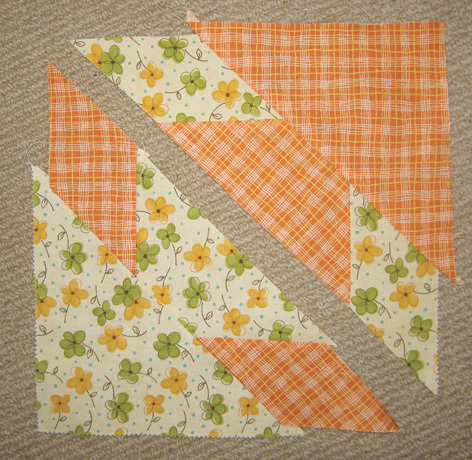 And, da-dah, there you have it, a finished square! I have completed one and it looks like yours. Let's hope it measures up correctly. Woohoo Sandra! A square and a post! Yay for you. I have emailed the quilting lady today, so I should hear back tomorrow re timing and we can then work backwards for when I'll need the squares back from all of you. Tara I still have 7 squares to do and Stace will come and help on the 18th April as it is the only day that is conveinient for us to get together. Going to Yarrawonga today,-back Monday and then off to Melbourne on Wednesday to see the Australian Quilt Exhibition Looking forward to that. Bye the way what size should the finished squares be? Sandra. Heh guys I'm back from NZ. Had a great time. Can't wait to get into this quilt but I have to wait till I go to Sydney in May. Probably just as well. It's taking me hours to get through all these blog postings. It's looking great. Ha, ha, good spotting Ma. The iron was off.